Fabulous indeed and always an enriching experience. You look fabulous layering by the lake. Love the dusky pink and baby blue combo - looks fabulous! It almost goes without saying on your blog: You look stunning in those wonderful photos! Even though I've lived in London, New York and now Berlin, I've never managed to go to a fashion week. Film Festivals seem to be more my thing. I've seen a lot of pictures of the Orla Kiely show around the web though and found it really beautiful. There is something so over glamorized about secretaries during that time. I wonder why. Surely it must have been a dreadfully boring job, just as it is now. 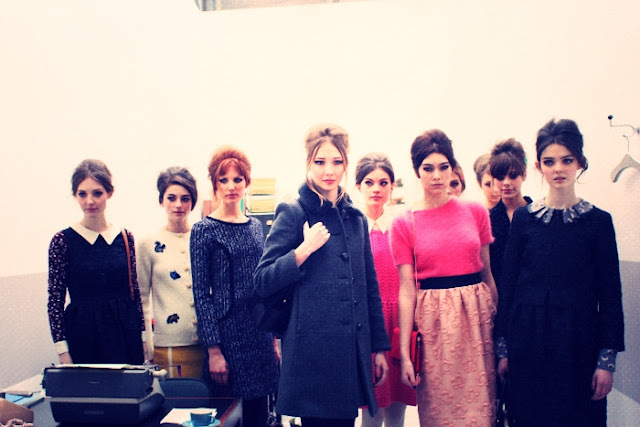 This is great that you were able to find thrifted versions of Orla Kiely. I love her things but rarely see them second hand here in the States. She has a great vintage vibe in her collections. I have one dress. What a fab post-in the same way as you render the multi-sensory experience of Kiely's show so too is your writing vivid and sensuous. It certainly is interesting to speculate whether we have backpedalled somewhat in celebrating an aesthetic such as the fifties secretary without considering the deeper cultural associations - and if we restrain our sexuality in replicating it.There is undoubtedly a joyful performativity inherent in modern day fashion nowadays which allows us to flit between era's at will. Ahh this light shade of pink mingling with blue against the silent country landscape makes the perfect story. What a gorgeous poem, Roz! I love your hair piled up and bound like that, too. My mum was a secretary in the 70s and it was a glamourous but submissive type of role that I don't think (at least I hope) doesn't exist in the modern office environment. That's a beautiful homage to Orla Kiely, and I especially enjoyed your poem Roz. Plus I love your analysis of our use of fashionstyles from the past. It doubtless rings true with many of us, that we enjoy the best of both worlds nowadays: we can wear the styles of yesteryear, enjoying the beauty of earlier periods of fashion, but do so within the context of living at a time when we women experience more freedom and opportinities than we have ever had before. We are lucky. Glad you had an inspiring time at LFW! I read your piece in the link, so I'll confine my comments to that since most people seem to have given you plenty of positive feedback about the poem and the piece on your blog, and I don't need to repeat them! I liked what you had to say, and now I relate to it on a different level-- not because I modeled as well, but because I just had a baby and that experience changed my perception about bodies and beauty in a way that might mirror your own experience (or in my thoughts does) of scoliosis. Just being healthy and strong became the only thing that mattered as I maneuvered through my pregnancy, tested for a battery of possible diseases or problems. I was one of the lucky ones, and I really felt it. It made me feel so differently about my body, so blessed to be strong and fit and not in pain and to have a strong and healthy. That experience redefined beauty for me... On another note, it stinks how women have this one-size-fits all ideal for what a good mother is just like we do for what a beautiful woman is as you pointed out in your piece. Why do women judge each other constantly? I think Earth Mothers are wonderful, but that isn't me! I met one the other day who was quite nasty and judgmental because I had a c-section instead of a natural birth and was wearing makeup and had brushed my hair and so forth. I thought to myself: why can't she be happy being herself and let me be me? It made me realize no matter how our sphere changes, women bring these judgments with them to every stage of their life. Women learning to be friends with each other and with themselves is the next stage of liberation. This tendency to judge other women coupled with a horrible fear of being judged is holding women back as much as one of its symptoms: the obsession with a certain body type. This looks like a beautiful presentation. Roz I've just read your article on All Walks: such a brilliant piece, as articulate and thought provoking as usual. And for the record, in response to your misgivings about your growing body, you looked beautiful as a 14 year old, and you look just as beautiful now. As you so astutely put it, there is no one right or wrong way to look: but I hope you can embrace and celebrate the changes in your body, rather than feeling those misgivings about no longer 'fitting' to the model ideal. Your gorgeous new curves signify all the strength, depth and sensuality that becoming a woman brings. All the happiness and challenge that awaits you in adulthood. Your opening lines and images are very evocative. I really enjoyed them. I think it's sad that whilst opportunities for women have opened up in other work spheres, the respect that women who still work in clacking professions, on newer technologies and in less restrictive clothing(! ), has dwindled in general. I also enjoyed your piece in All Walks... Hope you are well. I've never gravitated to the styles of the '50's. They don't suit my body, for one; the proportions aren't quite right. I also watched my older sister struggle to break free of the cultural vestiges of that time, still imposed on women in the early '60's. 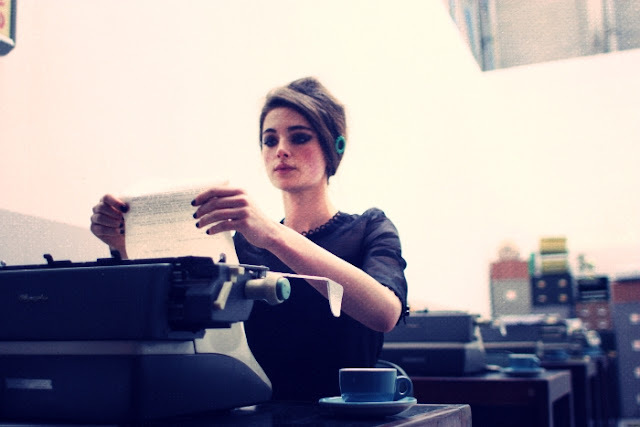 I don't find it romantic to put women behind typewriters, however quaint it might seem now. I will say that you look pretty, with your hair up and in wonderful t-strap shoes, but overall, I'll take a less confined, rebellious bohemian style any day, from any era. I read your essay about body image and modeling; it was so on point. You have a wonderful voice in this community and beyond. What a beautiful post, Roz. Thank you for your comment and for letting me know about this. I am so glad you are enjoying the necklace. I am sorry, I have been slacking on blog-reading and posting my own posts. I am trying to work on my other projects and also perpetually dealing with my chronic facial pain. Your blog is so beautiful and you are an inspiration to me :) You are a beautiful person. I so enjoyed your poem, especially the "throng of knits" lyrical couplet! And just because my mind often takes a turn towards the bizarre, the pastels, pinks, bouclé and teacups brought an unexpected image of Dolores Umbridge. Certainly not anywhere as beautiful as your poem, outfit and Orla Kiely models. You've brought up fond memories of the clacking of typewriter keys. Not something many people recognize anymore. As a little kid, I would type onto my parents' old manual typewriter, fascinated by the hammers striking their letters onto the paper. Then, I used their electric typewriter, which had its own little whirring sound and revolving ball of letters swivelling its marks on the paper. It rather looked like R2D2's head when he was on about something. This an incredably sophisticated look you put together and it feels so nostalgic to me.